Henry Edridge was born in Paddington and was his career began after being apprenticed to the mezzotint engraver Wiliam Pether, who was also a miniaturist. From 1784 Edridge studied at the Royal Academy Schools, where his work was much admired (and acquired) by Sir Joshua Reyolds. In 1786 Edridge gained recognition after being awarded a silver medal and in the same year began exhibiting at the Academy, exhibiting a total of 261 works until his death in 1821. As well as being a highly talented miniaturist, Edridge also painted works on paper and his small, full-length figures in landscapes gained him great repute, painting prominent figures such as Lord Nelson and Prime Minister William Pitt. 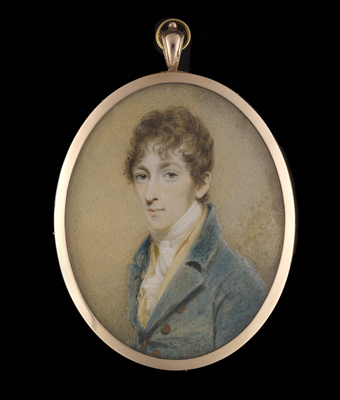 Edridge’s portrait miniatures are typically small which makes the present work more unusual at over three inches in height.